So, you have decided to wear a green dress for your prom? Not for the prom but for a friend’s wedding or for a party or may be for an event. So, the dress is chosen but you are still confused about the makeup that you should pair with that gorgeous green dress. Worry not! 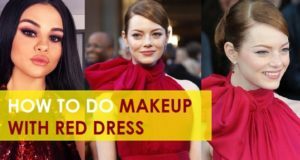 In today’s post we will share some of the best makeup ideas that you can pair with the attire. Green is a cool color that looks great on all the skin complexion. Imagine if you are fair, dusky or medium skinned women, the green still complement the skin color and won’t make you look darker or extremely light. It’s a color of prosperity and unlike blue women of all colors can wear it. Having said that, in green too there can be variety of shades like a lime green, medium green, grass green, olive green, sea green, dark green or even an emerald green. 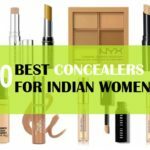 So, let’s check out which are the beautiful makeup that looks great with green colored dresses. For the face, it is always good that you have a good flawless skin. For green dress, the idea is to make the skin look polished and smoother. A bit of blemishes etc are still fine but a heavy cakey looking makeup with green dress for the day time is a strict NO NO. Reason for this is that when you go heavy with the unnecessary makeup it looks a tad bad with greens. On the other hand for black dress the heavy base can still look good and for the red dress as well. Try using a sheer light foundation and cover the under eye circles. This will give a better than before skin. You can apply the foundation in dots and blend that using your finger or a foundation brush. 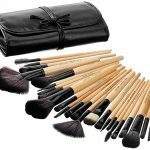 We like to use foundation brushes as that gives good finish. So, once the foundation and concealer is done, set that up with loose powder. Now let’s move to the eye makeup idea. You may not use blue eye shadow with blue freely without thinking much but green eye makeup with a green party dress can never look bad. 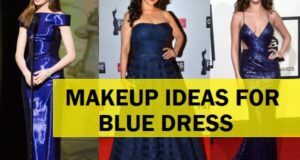 You may have noticed at our segment where we discussed about the makeup with blue dresses, we said that it is good to try a navy blue, brown or black eye shadow make up with blue dress though with green you can use green. Moreover, green eye makeup looks so complimenting with your green clothing. Apply a base or primer to prime and even tone the eyelids. Then take a green eye shadow matching the dress and apply it on the eye lids. Take a blending brush and take 2-3 shades lighter green eye shade and apply on the crease area. Mix a little black if you do not have a darker green color. 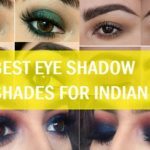 Apply eyeliner as per your choice but do not use a green eyeliner over green shadow . Apply mascara and you’re done. Other eye shadows that can be used with green dress are the ever green smokey black eyes, soft brown, kohl rimmed eye makeup. 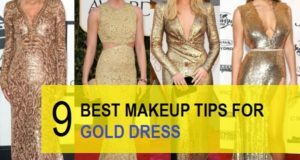 Or even a gold and bronzey makeup for eyes looks great with your dress. Lip colors should be chosen carefully while wearing greens. This is because the color of the dress and the color of the lipstick shade should complement else that can look out of the place. Okay, so the best lipstick that looks beautiful with a green dress will be a coral, pinks, peachy colors, deep red or strawberry red. 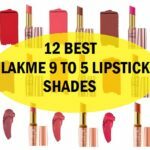 These lipstick colors should be chosen as per your skin tone. For the evening makeup, you can try a bronzer with the green clothing or for the day time try a soft light peachy color. This will just adds a natural flush but will not be visible much. A light pink can also be tried. Apply a highlighting color as well for the party look as with green too highlighted brows and cheeks looks nice. 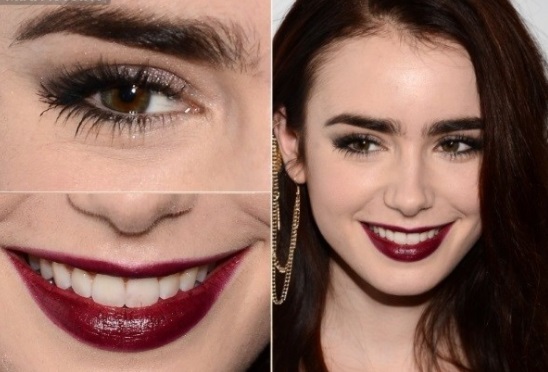 Now, it’s time to throw in some celebrity makeup looks for the green red carpet looks. Orangish red with a soft blush and low on eyes makes this look very stunning. The medium green dress makes the red lips pop and both stands out. You too can try a soft makeup with bold lips like this. She has paired her deep red oxblood lip color with a sea greenish dress. Did you noticed how she incorporated green in her eyes? This is what we were talking about. The green eyes with green dress is a lovely combination. But as her lips are dark she chose to keep the green on the eyes less. So, she had used the green eyeliner on the lower lid. Well its sea green actually, but you got the point, Right? This bright green dress is beautiful and so does her eye shadow. The green eye shadow without the eyeliner looks perfect with her dress. The missing eyeliner and a light gloss on the lips actually help to make the eye shadow and the dress pop. You should surely try this out. Mila Kunis opted for a soft brown eye look with a peachy gloss. Ah!! She looks stunning here. Here, the smokey black eye makeup with black eye shadow also looks good with the neutral lips. Smoky eyes look great with green dress. 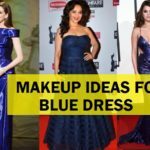 These were the beautiful makeup ideas with green dress that you should try! Also these makeup for green dress can be done for party or your first date.